When you mix bad hair, disturbing metallic outfits, and inspiration from the worst music ever created, the result can only be Dazzler-icious Shimmer-riffic! On the plus side, Shimmer never has to worry about showing up at a party where some other super-chick is wearing the same outfit. So that's nice. Of course, that's because no one else in their right mind would ever think of making an entire costume from metallic spandex, then topping it off with the worst Day-Glo-orange Afro this side of Bozo the Clown. You also have to be impressed with the large solid gold (and I mean solid, no clear-center hoops for this on-the-go gal!) disc earrings she's sporting, perhaps acquired in the same discotheque-gone-bust yard sale where she got the bulk rate discount on the spangles for her costume. Because nothing sets off a big white-chick Afro like ginormous flashing jewelry. What really makes the outfit for me, though, are the completely gratuitous cutouts in the front. As if skin-tight shining metal and a color scheme right out of the left end of the Crayola box weren't revealing enough, some guy (and I do mean guy) at Corporate must have sent a memo requiring the artist to use, and I quote, "more skin." That was Eighties DC for you, right at the cutting edge of class, refinement, and feminism. Given all of that, I can't blame Shimmer for turning to a life of crime. If someone slapped those thigh-boots and long gloves on me, I'd sure as hell feel like killing someone too. So you go, girl! Now Jeff, is that not the same outfit you have on in that picture of you standing in front of your Village People collection? That is a PRIVATE photo, HK! I guess this was her idea of stealth? 2) Rap is the worst music ever. At least all this ghangsta rap that comes out now days. it is an ugly costume though. The color combo is anyways. I shouldn’t of posted it then. Oops. Careful with that sort of thing, HK! This has to be said…. *braces for the impending beat-down* In regards to the fifth paragraph, what would she have looked like had she been created in the first decade of the 21st century by a female advocate for neo-feminism? More than likely, her bright pom-pom hair do would be replaced by either a “boy-cut” mouse-brown deal, or your common blond butchy mullet with highlights, her jewlery would be replaced with enough body piercings to fill a tackle box, her thigh high boots would become an unpolished pair of Doc Martin’s, her elbow-length flashy gloves are cut down to biker-cut fingerless gloves with the knuckles cut out, and her ovely zazzy, uber flashing, skin-tight, cut-out metalic spandex would be covered with a lumberjack amount of denim, leather, and flanel. 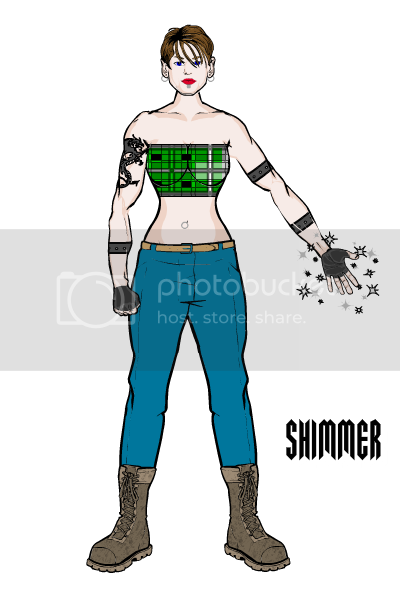 Let’s all be thankful we don’t have a manly version of Shimmer to deal with. the jokes would be endless, and the chafing would be painful. Actually, I kinda like her. So you like a bit of shimmering in your love life Legatus. We could go in a partner look. Are we sure that’s really a woman? She’s packin’ something big in the crotch of that gold lamee body suit. I dunno… she’s pretty hoochie-coochie-momma and… wait… What is she doing to Deathlok?! My bad. Cyborg. Whoa, Legatus! 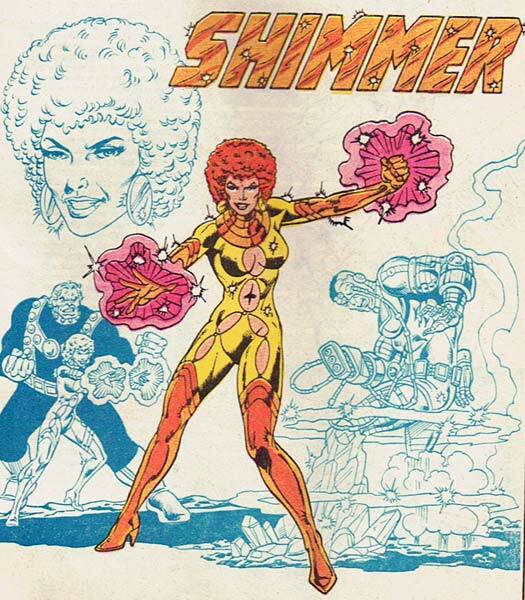 Shimmer’s partner is what Richard Simmons would look like if he were dressed as a superhero! I don’t know, RitoruBushi, is this really that bad? I had a nice and lengthy post, hit the wrong button, so I am doing this short out of anger of stupidity. In keeping with the sidekick posted by Legatus, I am providing a henchman for Shimmer. Enjoy. This era has tons of bad costumes! Legion of Super-Hero fans call it the Disco Era. I guess that the only costume that came out of the disco era that still is stuck to a character is Starfire and her skimpy alien swimsuit leotard. Although I really like it better with the thigh-high boots instead of the original calf-high boots she had in the 1980’s. JP, Robin/Nightwing is one lucky S.O.B. Can only imagine Shimmer saying lines straight out of blaxploitation movie. I agree with HaydnDnc95. Dazzler is much better than Shimmer in terms of original costume. Her costume, while shiny, didn’t have the blasted cut outs that Shimmer had, but it did had rollerskates, which I hate. I think a simple update of her shiny costume would be exchanging the rollerskates for a pair of knee-high black or lavender boots in order to make it more modern. Another update would be taking away the bangles and adding black wrist-length gloves. Someone could duck underneath her legs when shes standing still, and unbutton her costume. Epic Fail.